Commuting has a major impact in today’s world, particularly on income eventually dispersed throughout a region. A residence adjustment used by the Bureau of Economic Analysis converts earnings by place of work to place of residence and helps estimate the impact of commuting on a county’s income. To get the residence adjustment, the money earned at jobs within the county by people living outside the county – outflow of earnings – is subtracted from the amount of money earned by residents who work outside of the county – inflow of earnings. Counties with the highest earnings of residents who work outside the county include Canyon, Kootenai, Ada, Bonneville and Jefferson. These counties all share a labor market with other large populous counties, which have many employment opportunities, and in some instances workers in those jobs earn more as a group. The inflow as a percent of earnings by place of residence shows how much rural counties benefit from their proximity to jobs in a larger metropolitan area or an area with a large employer that the region depends on. Counties with the highest earnings from in-county jobs held by people living outside the county include Ada, Butte, Canyon, Bonneville and Nez Perce. Typically, a county with the largest regional employment base incurs the largest share of commuters. 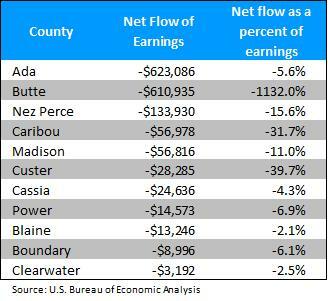 Ada County has the largest outflow of earnings due to its large and diverse economic base. 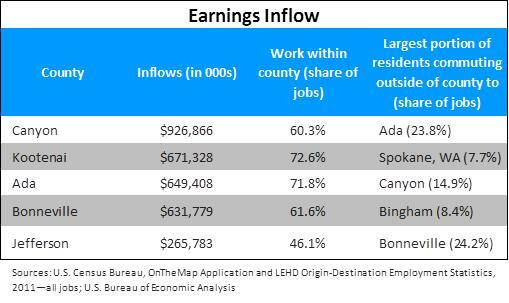 The data really shines in Butte County, home to the Idaho National Laboratory, where outflow earnings are much higher than residence net earnings, illustrating the importance of high wage jobs in a rural area that people are willing to commute to from surrounding areas. According to Census data, only 16 percent of the county’s population live and work in Butte County. Approximately 42 percent of Butte County’s workforce resides in Bonneville Count with another 18 percent in Bingham County. Custer is another county with a high share of outflow to earnings at 96.4 percent—attributed to another large, single employer in a very rural area — the Thompson Creek mine. 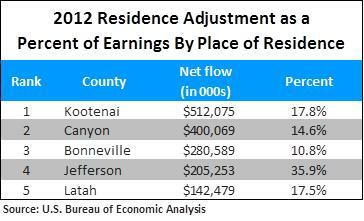 When considering the net flow of earnings – the residence adjustment – Kootenai and Canyon counties gain the most from commuting with positive flows reaching upwards of $500 million in Kootenai County and $400 million in Canyon County. Higher wages in the commuting destinations of Spokane and Ada counties as well as larger employers and new establishments have partially caused an increase in the number of people commuting to those areas, and that further increases the inflow of earnings. As a result, the residence adjustment rises in the resident county with a concomitant reduction in the counties where the work is done. This is true in most high commuting areas with not only higher wages but more employment opportunities. The net flow of earnings in Ada County was negative in 2012 – a reduction of $623 million – accounting for a 5.6 percent decline in earnings. 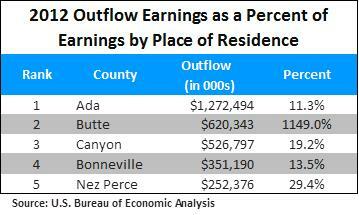 At the same time the positive net flow of earnings in Canyon County accounted for 14.6 percent of residence earnings. 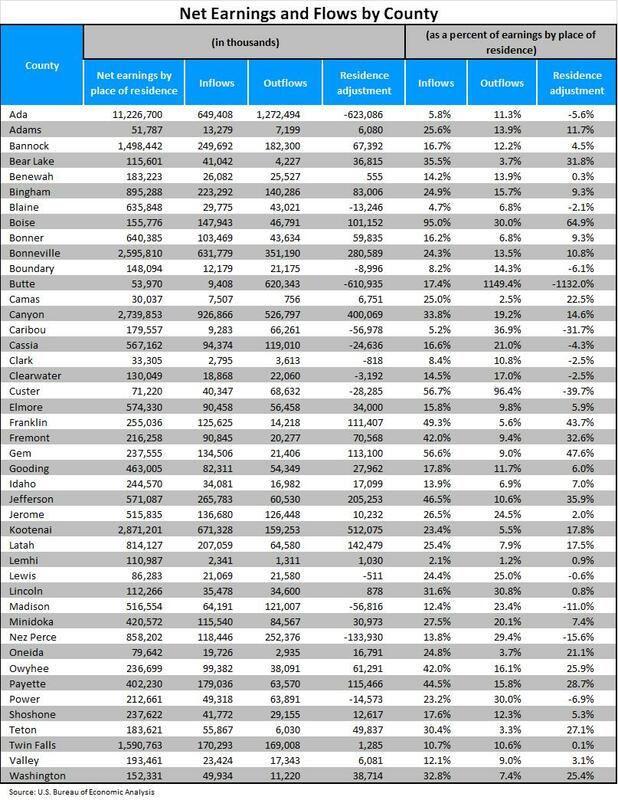 However, as a percent of earnings by place of residence, nearly 65 percent of the money earned by residents in Boise County came from outside the county – the highest share of any county. Gem and Franklin counties also benefitted from outside money – 47.6 and 43.7 percent respectively – a result of a large share of the population commuting elsewhere. Nearly 40 percent of residents in Boise County commute to Ada County for work and 24 percent from Gem County commute to the greater Treasure Valley area for work — 14 percent to Ada and 11 percent to Canyon counties. Thirteen counties had negative net flows, indicating more money flows out to other places than what is brought back to the county by residents working elsewhere. Areas that share a labor market benefit from outside money, but the extent depends on several factors such as wages, large employers and new establishments, factors that increase the number of people commuting over the border to work for these opportunities and, therefore, the inflow of earnings. That ultimately impacts the net flow or residence adjustment. 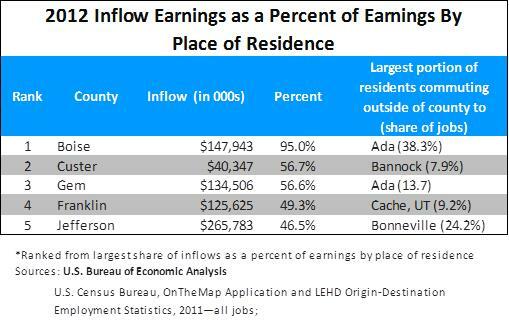 Counties in other states that border Idaho counties generally share the largest portion of jobs that residents retain and therefore play a significant role in net flow of earnings for Idaho counties. This entry was posted in Employment News and tagged Bureau of Economic Analysis, commuting, idaho department of labor on June 2, 2014 by Idaho Department of Labor.